Learn the right way to determine whether clients have true food allergies so they can get the relief they need. Food allergies, sensitivities, and intolerances are hot topics in nutrition and dietetics and are pervasive among clients and patients. If RDs do a quick Google search of these terms, they'll get more than a million hits. Links to resources such as FARE (Food Allergy Research & Education) pop up, but so do links from companies offering diagnostic tests for people to use from the comfort of their homes. In fact, many tests available to consumers for diagnosing food allergies are endorsed by celebrities and famous internet health gurus. But how reliable are these tests, and should dietitians recommend them to clients and patients? In any discussion about food allergies, it's important to start at the beginning. A food allergy is an immune-mediated reaction that happens reproducibly each time a food is eaten. Why food allergies develop in the first place is an active area of study, and no one understands exactly why some individuals develop allergic reactions and others don't. One theory is that early exposure may sensitize infants to proteins through the skin (particularly through broken skin or skin with eczema), and concurrent oral exposure may induce tolerance.1 Conversely, when oral exposure is withheld, allergy becomes more likely in the presence of skin exposure. The National Institute of Allergy and Infectious Diseases guidelines for the diagnosis and management of food allergies in the United States give sound instruction on the art and science of food allergy diagnosis.4 Diagnosing food allergy should include a combination of a convincing history, laboratory testing such as the skin prick test and the serum immunoglobulin E (IgE) test, and, whenever safe, an oral food challenge.4 The reality is that diagnosing food allergies can be tricky, as it takes both skill and experience; a board-certified allergist is uniquely trained in this area. One of the most important things dietitians can do to assist patients who think they have food allergies is to help them take an accurate food history. Food recalls often are unreliable, but RDs can work around this by asking patients to create a food and symptom diary prospectively. In this case, the patient writes down everything he or she eats throughout the day in real time, along with specific symptoms experienced. When it's impossible or impractical to gather a prospective diet log, it may be helpful to give patients a questionnaire. Skypala and colleagues developed a dietary questionnaire specifically for food allergies, and it's available for pediatric and adult patients.5 While the documents were developed for a European population, they can be used with patients in the United States, although practitioners will need to make the necessary modifications for culturally appropriate foods. An accurate and reliable diet and health history is essential because it lays the foundation for all other steps leading to the diagnosis. An accurate diet and symptom history will help determine the specific foods for which an individual should be tested, or which foods should be eliminated. The history also can help reduce the unnecessary elimination of safe foods. Among the diagnostic tests available to identify food allergies, the most common include the skin prick test and serum IgE test. These two tests are helpful, as they're particularly good at negative predictability—determining which patients don't have food allergies. However, because these tests have low predictive value for making a diagnosis, they should be used in conjunction with a positive history.4 This means that laboratory testing should be limited to the foods that have been specifically correlated with or suspected of causing adverse reactions (eg, a patient eats shrimp and has swelling of the lips and difficulty swallowing within 30 minutes). Because of the high rate of false positives, these tests shouldn't be used for screening or for testing many different foods simultaneously without having a history of reactions to those foods. Positive results suggest the likelihood of a true allergy (the higher the reaction/response, the more likely an individual is allergic), but they don't indicate the severity of potential reactions. "The absolute most important part of determining a diagnosis of food allergy is the clinical history," says Dave Stukus, MD, pediatric allergist at Nationwide Children's Hospital in Columbus, Ohio. "If someone is eating a food and not having immediate onset or reproducible symptoms, then there's rarely any reason to perform food allergy testing for that food." When it comes to diagnosing non-IgE adverse reactions to foods or food sensitivities, the process can be trickier. There are no independently evaluated, peer-reviewed, and validated laboratory tests for food sensitivities. Stukus explains that when he has a patient who's interested in purchasing a commonly marketed food sensitivity test, he tells them they're unreliable and explains why. "The most common example is food-specific IgG [immunoglobulin G] testing, which is used by many to diagnose food sensitivity. A basic understanding of immunology quickly demonstrates why this is problematic. IgG is a memory antibody that we all form after exposure to foods. It's a normal physiologic response to develop IgG to foods we eat. Foods we eat more regularly often cause higher levels of IgG." With regard to tests that claim to diagnose food sensitivities by white blood cell activity, Raquel Durban, MS, CSP, RD, LDN, of Asthma & Allergy Specialists, PA, in Charlotte, North Carolina, says, "White blood cells are always shifting in activity. Just because there are more white blood cells in that moment of testing does not reflect that a food is the cause." It's important to note that most insurance companies don't cover food sensitivity testing. According to Durban, "The lack of scientific evidence is why testing for food sensitivities isn't covered by insurance." So why are there so many food sensitivity tests available on the market? The FDA doesn't regulate laboratory developed tests (LDTs) the same way they do other medical devices.6 In addition, the Clinical Laboratory Improvement Amendments program administered by the Centers for Medicare & Medicaid Services only addresses whether or not the test does what it claims (eg, measures specific blood components, such as IgG)—not the validity of test results in diagnosing a specific condition as advertised (eg, IgG equates to food sensitivity). Originally, this was because LDTs were used for internal hospital and academic research and weren't intended for consumers to use (and often interpret) at home; however, things have changed. This loophole allows laboratories to create their own proprietary tests and market them directly to consumers without having to prove their validity beforehand. In 2015, the FDA sought to expand its oversight and authority over LDTs. Many concerned health care practitioners welcomed this action by the FDA while those in the LDT industry and in alternative health care shunned it. Ultimately, the FDA couldn't issue final guidance.6 In a discussion paper released in January 2017, the FDA indicated, "LDTs play an increasingly important role in the provision of high-quality health care and many laboratories perform good validation of their LDTs and provide high-quality, professional management of their operations. However, currently, patients and providers cannot uniformly rely on all tests offered for clinical use as some are not subject to active premarket oversight to ensure they provide accurate measurements and valid claims. "6 The full paper the FDA released reviews a variety of possible ways LDTs could be regulated in the future. If patients already have used any of these methods for food sensitivity testing, it's important to broach the subject with respect. David Fleischer, MD, director of the allergy and immunology center at Children's Hospital Colorado, says he understands parents' propensity to blame food when their children are suffering from abdominal pain or behavioral concerns. "Foods get easily blamed, as these symptoms often occur within hours of ingesting food since there's no period longer than two to four hours when kids don't eat something, except when they're sleeping. 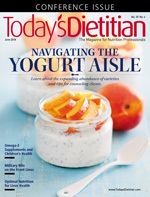 So foods are an easy culprit," Fleischer says. He explains to families what these tests mean and what they don't mean, and works with them to identify true food allergies if they exist. Likewise, Durban encourages her patients to take test results such as these "with a grain of salt." • True food allergies should be ruled out first. Because IgE-mediated food allergies can cause life-threatening anaphylaxis, a board-certified allergist should evaluate the patient first to ensure they don't have true food allergies. • Elimination should be targeted (avoiding the elimination of a whole food group, if possible), and should last approximately two to four weeks. • Reintroduction is essential to diagnose an intolerance or sensitivity. Without a reintroduction period, it's impossible to confirm whether the food or foods eliminated are responsible for improved symptoms. Practitioners should work with clients to create the most liberal diet possible within the constraints of the elimination diet to ensure nutritional adequacy and maintain quality of life. According to Durban, clients with a long list of potentially offending foods should begin by removing one or two foods over the course of one to two weeks. "If after one to two weeks, symptoms persist, reintroduce those foods and repeat the process with another suspected food," Durban says. The process can take time, but it's the most reliable way to identify offending foods. Once a food has been identified as a potential allergen, an oral food challenge should be considered if it's deemed safe. Due to the possibility of a patient experiencing anaphylaxis, only a trained practitioner with access to life-saving medications and emergency medical interventions, such as a board-certified allergist, should conduct an oral food challenge. An oral food challenge involves giving very small amounts of a potential allergen to individuals and gradually increasing the dose until they've eaten a full serving or had an allergic reaction. Patients should be supervised until at least two hours after they've eaten the last dose, since anaphylaxis is always possible with IgE-mediated allergies. If IgE-mediated allergies have been ruled out, reintroduction is an essential part of helping clients identify problem foods. Because elimination diets often include multiple foods, it's impossible to know what specific food may benefit a client without reintroduction. Other factors, such as a reduction of highly processed foods, decreased alcohol or carbonated beverage consumption, and increased intake of fiber and fluids, can contribute to an improvement in symptoms. In addition, the practitioner's goal should be to help clients liberalize their diets as much as is safe to encourage a varied and nutritionally diverse eating pattern. In practice, dietitians have an incredible opportunity to help patients suffering from negative symptoms related to food. By working closely with patients and as part of a health care team, dietitians can help identify foods that trigger adverse reactions, liberalize diets where possible, and meet nutritional needs to prevent deficiencies and protect quality of life. — Sherry Coleman Collins, MS, RDN, LD, is president of Southern Fried Nutrition Services in Atlanta, specializing in food allergies and sensitivities, digestive disorders, and nutrition communications. Find her on Twitter, Instagram, and Facebook @DietitianSherry, via the Southern Fried Girlfriends podcast, and at www.southernfriednutrition.com. * Coleman Collins reports the following disclosure: She's a consultant for the National Peanut Board. 1. Lack G. Epidemiologic risks for food allergy. J Allergy Clin Immunol. 2008;121(6):1331-1336. 2. Du Toit G, Roberts G, Sayre PH, et al. Randomized trial of peanut consumption in infants at risk for peanut allergy. N Engl J Med. 2015;372(9):803-813. 3. Berni Canani R, Gilbert JA, Nagler CR. The role of the commensal microbiota in the regulation of tolerance to dietary allergens. Curr Opin Allergy Clin Immunol. 2015;15(3):243-249. 4. Boyce JA, Assa'ad A, Burks AW, et al. Guidelines for the diagnosis and management of food allergy in the United States: report of the NIAID-sponsored expert panel. J Allergy Clin Immunol. 2010;126(6 Suppl):S1-S58. 5. Skypala IJ, Venter C, Meyer R, et al. The development of a standardised diet history tool to support the diagnosis of food allergy. Clin Transl Allergy. 2015;5:7. InVitroDiagnostics/LaboratoryDevelopedTests/UCM536965.pdf. Published January 13, 2017. Accessed April 15, 2018. 7. Allergy Society of South Africa. Position statement: ALCAT and IgG allergy & intolerance tests. https://www.mm3admin.co.za/documents/docmanager/8e7be0a4-2b8d-453f-875e-cd1e5132b829/00015032.pdf. Accessed April 15, 2018. 8. Stapel SO, Asero R, Ballmer-Weber BK, et al. Testing for IgG4 against foods is not recommended as a diagnostic tool: EAACI Task Force Report. Allergy. 2008;63(7):793-796. 9. All about allergy testing. American Academy of Allergy Asthma & Immunology website. https://www.aaaai.org/conditions-and-treatments/library/allergy-library/all-about-allergy-testing. Accessed April 15, 2018.